Today, to much excitement, we saw the release of the NICE major trauma guidance. Nat did an excellent review of the draft guidance, which you can read here. We now have the full guideline which you can download from this link. You can also download our infographic by clicking on the picture below. Remember that this is just a quick update. Please visit the NICE guideline site, look at the evidence for yourself and review Nat’s original post. Suppose the above scene happens in a city near you. What treatment does NICE recommend Alex Murphy receive? He is currently in an industrial site somewhere and looking in pretty bad nick. Although the baddies avoided shooting him in the face, he looks as though he is fairly unresponsive. He’s going to get an RSI on scene within 45mins if possible, otherwise he is going straight to an MTC (if under 60mins away), or trauma unit (if longer than 60mins) where he will receive his RSI. His chest has been shot several times, so we can expect him to have penetrating chest wounds, or if he was wearing a bulletproof vest, he may have a number of rib fractures with underlying contusions, or both! If we are still on scene and have an US then he will undergo an eFAST scan, being mindful that it cannot exclude PTX. If we are suspicious of tension PTX, then we can ditch the cannula and go straight for the blade, and the same deal applies in hospital. Given the amount of damage that he has taken, he is going to need a pelvic binder, a tourniquet(s) to stem massive haemorrhage and tranexamic acid ASAP, but not after 3 hours. NICE don’t advocate haemostatic dressings, but for catastrophic bleeding (Ed – but we are going to use them in Virchester). We’re going to struggle with peripheral access here, so it’s ok to pop in an Intra-osseous until we are able to get central access. If we are worried then NICE still recommend a semi rigid collar, blocks and tape, but they are at least less likely to recommend this than in the past. On the way to hospital we are going to practice a fluid restrictive strategy, and maintain a palpable carotid or femoral pulse. We can maintain these palpable pulses with crystalloid, but only if we do not have blood products available. If Alex was awake we would give morphine for his pain, and then ketamine as a second line agent. Once we are in hospital we DO NOT use crystalloid and opt for a balanced transfusion of 1 unit of plasma to 1 unit of red cells. We can access this via our major haemorrhage protocol until we get some laboratory results back and can use them to guide our choice of components. We are not going to use the USS probe to decide about CT, using an eFAST technique (so long as it does not delay) we are going ASAP, and obtain a whole body scan, and that means a scanogram to the toes and then a full CT to mid thigh. If he is haemodynamically unstable and is a non-responder to resuscitation then we are going to theatre to practice a damage-control approach, however if he is a responder or is haemodynamically normal then we may elect to definitive surgery. Interventional radiologists are a useful ally if we have identified arterial bleeding in the pelvis or spleen/liver/kidney injury. That being said, in polytrauma, a combined approach with both surgeons and interventional radiologists is probably best. Alex Murphy’s colleague looked understandably shaken up by the whole events, so we need provide a compassionate approach to managing her feelings and expectations. Thankfully NICE have provided a great model of care for managing major trauma patients, and having implemented it, we have given Alex Murphy a great outcome…., but is this everything that we hoped for? Notably in the #FOAMed world semi rigid collars for suspected spinal injury are still in the recommendations although the indications for their use are less than in the past (the Canadian C-Spine rule is recommended). I struggled to find a question about whether they should be used at all, but rather it was an assumption that they are needed. No doubt this area will remain controversial for the foreseeable future. This guideline is pretty sensible and as the links above will attest there are many recommendations that we’ve been talking about on St.Emlyn’s for some time. What is really interesting in the full guideline (it’s 330 pages) are those areas that have not reached consensus and where further research is advised. The work done on the evidence base is impressive and I would recommend anyone interested in diagnostics to have a look at the sections on pneumothorax detection as examples of how we can perform diagnostic meta analysis. It’s also interesting to look at the key recommendations for future research in major trauma. There are four of them. Does TEG/ROTEM have a role? Should ketamine be a first line agent for pain? Should we warm patients, and if so how and which ones? Lastly, don’t think you can get away with just reading this blog and downloading an infographic. 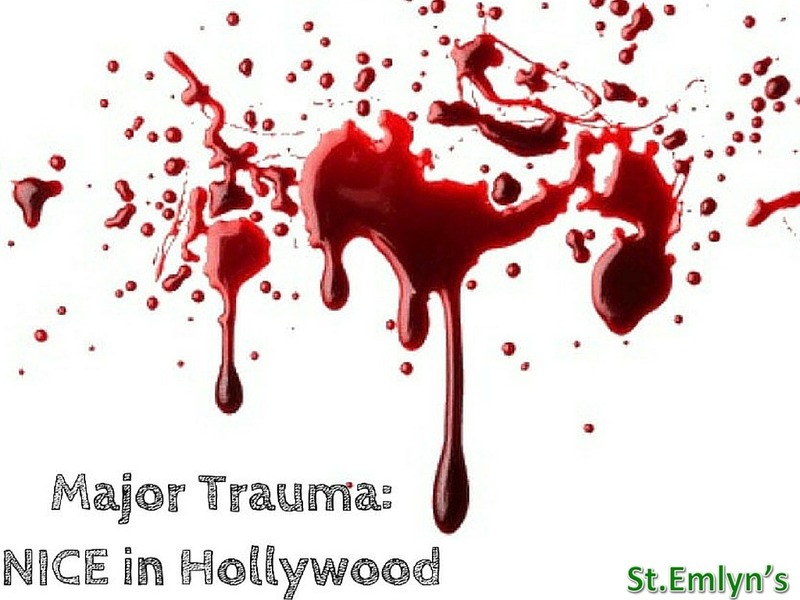 If you’re serious about trauma then make some time and read the guideline and the evidence behind it. Some very clever and diligent people have put a lot of time into the NICE guideline and they deserve our time to read the full document.